Much study and documentation has been done into the Western movement of slaves from Africa, that forcibly brought over 10 million Africans across the perilous waters of the Atlantic Ocean. But this wasn’t the only slave route that existed, ruthlessly taking African’s from their homes to foreign lands. The movement east across the Indian Ocean, between the first and 20th century, is believed to have involved around 4 million people. Beginning with the Arabs and the Ottomans, the trade was later continued by the Portuguese, the Dutch, the French and the British, helping to fuel their colonial expansion and even to help fight against the countries they were trying to maintain control over. Scholars estimate that in the 19th Century alone, around 350,000 Africans were forcibly moved to the Arabian Peninsula and then onwards to Iran and the Indian Sub-Continent with the then powerful Omani rulers of Zanzibar largely facilitating and controlling the vast majority of the trade. Not all migration was forced however, as African traders, travelers and mercenaries also sailed the same route but as free people in their small wooden dhow boats. Mastering the monsoonal winds that change direction twice a year allowed these sail-powered vessels to travel to and fro. The abolition of slavery began in the 19th century led by the British, whose own citizens created a strong and powerful abolition movement pressuring the Government to put an end to it. With their headquarters in Mumbai, India they sent out anti-slavery ships to intercept the incoming slave-boats and stopped ships of other powers forcing them to release their slaves. As a result, thousands of boats were intercepted and slaves already living on the continent were slowly released over time as deals were made between colonial powers, the Sultan’s of Oman who controlled much of the trade and their customers, the powerful and the wealthy of South Asia. Whilst some returned to Africa many stayed, forming unique communities that still exist today. But such freedom left many stranded in a foreign land that was subject to a rigid social hierarchy, and being freed slaves and outsiders this African diaspora were considered the bottom of that hierarchy. 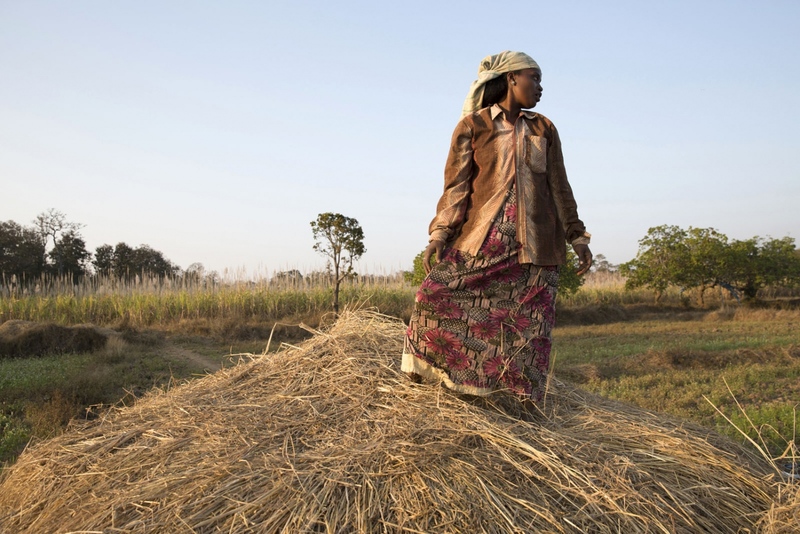 Many communities travelled in land, away from the coastal communities to remote forested locations where they were the dominant group hence safe from persecution and free to live peacefully. As a result there are African diaspora populations across western South Asia, and indeed throughout the peripheries of the Indian Ocean, that still survive today. Known as the Sidi in India and the Sheedi in Pakistan they number around 75,000 combined. 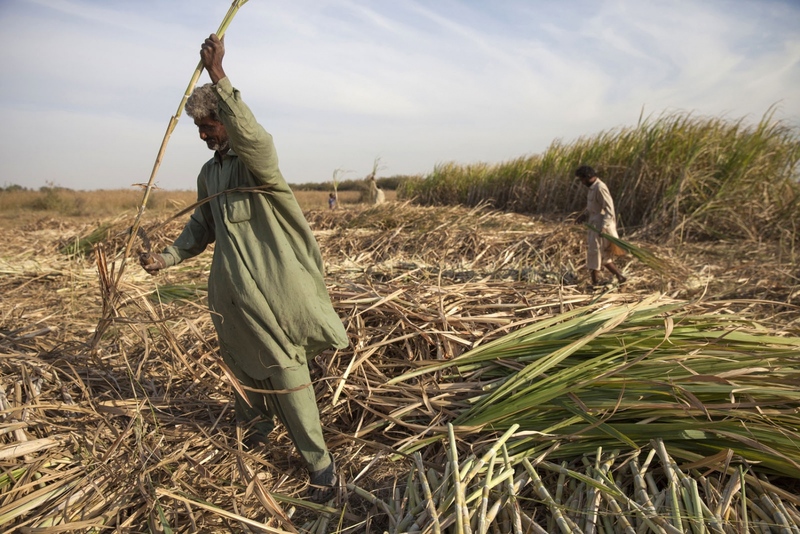 Pakistan is considered to have the largest African diaspora with a very active population of around 50,000. 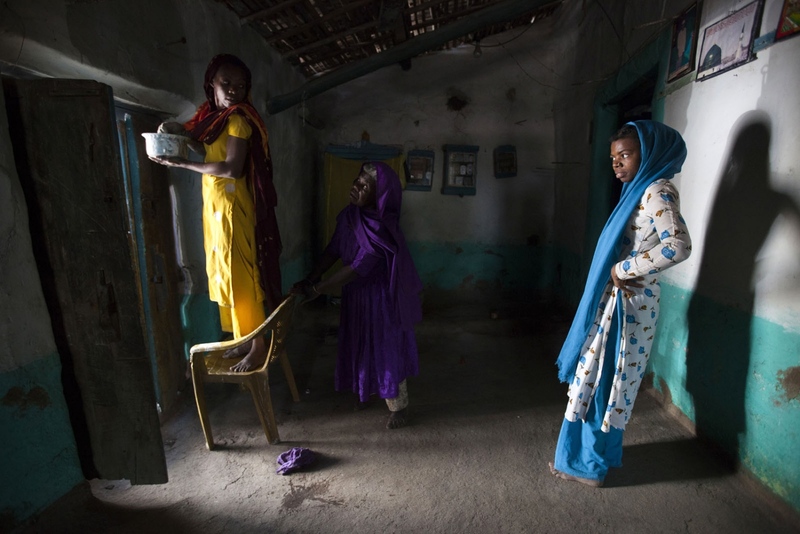 India has approximately 25,000 people of African origin know, locally as Sidi, with most living in the provinces of Gujarat and Karnataka in almost entirely African exclusive villages. Whilst assimilated in to Indian culture they often live separately and on the fringes of society. There were exceptions and India has a long history of freed African slaves, working as soldiers and bodyguards of Maharajah’s, who once released rose to become powerful rulers in their own right controlling armies of thousands and creating small Kingdoms. 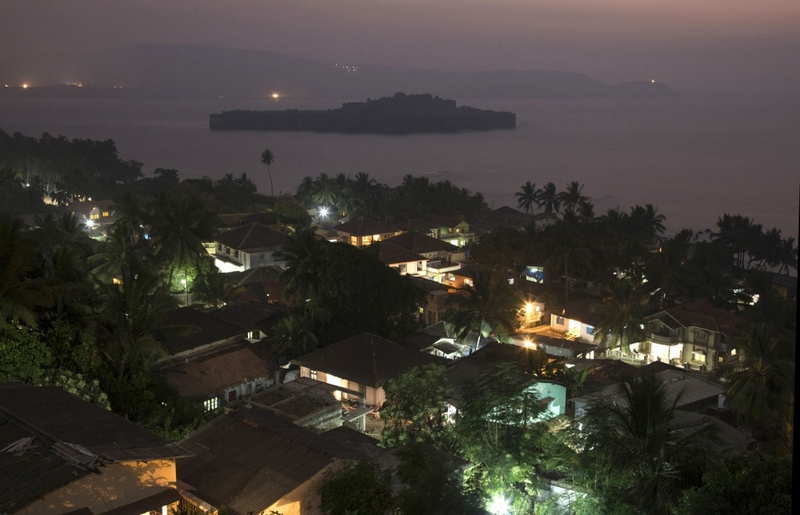 Between the 17th and 20th century African’s controlled a 300km stretch of coastline from Mumbai to Goa. 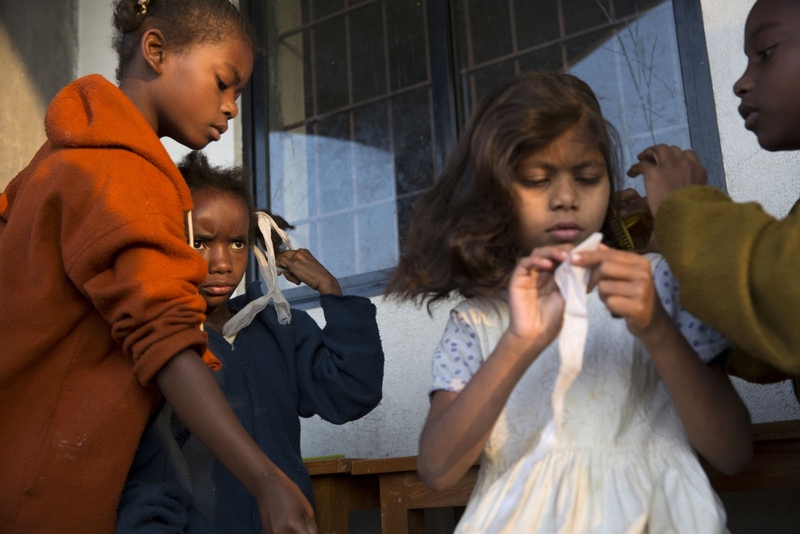 Still today, direct descendants of two Royal families of African lineage survive. 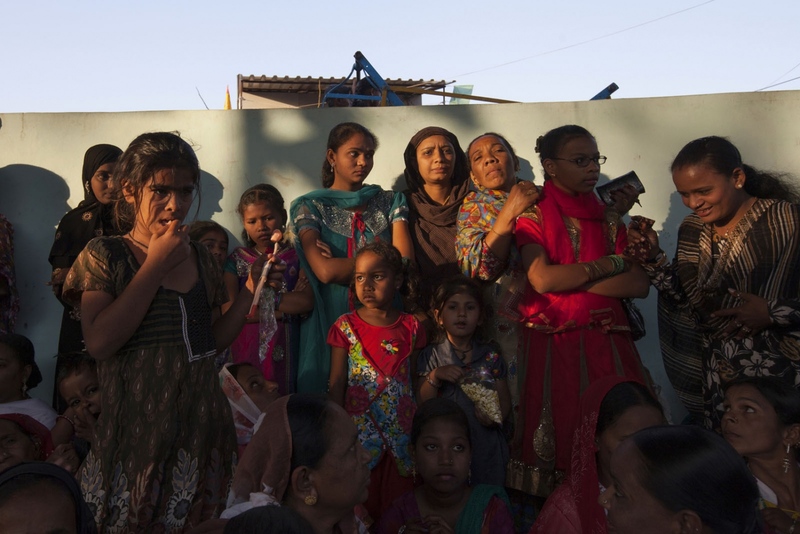 Family members of the Janjira and Sachin Royal families still live around the west coast of India, mostly in Mumbai and Gujarat. And further in land exist a regiment of African descendants who were the private army of the Nizam of Hyderabad. One doesn’t need to look too hard in to the history of South Asia to find mentions of African’s who played an important part in the turbulent past of the sub-continent. And this is where the connection between the past and today becomes confusing. You can read books talking about the Nawab of Janjira, the most powerful African ruler in India but find almost nothing about the people brought as slaves from Africa. Unlike the Atlantic slave trade there is very little documentation of the trade. So, the question of who? from where? Even how many? is very difficult to be answered. 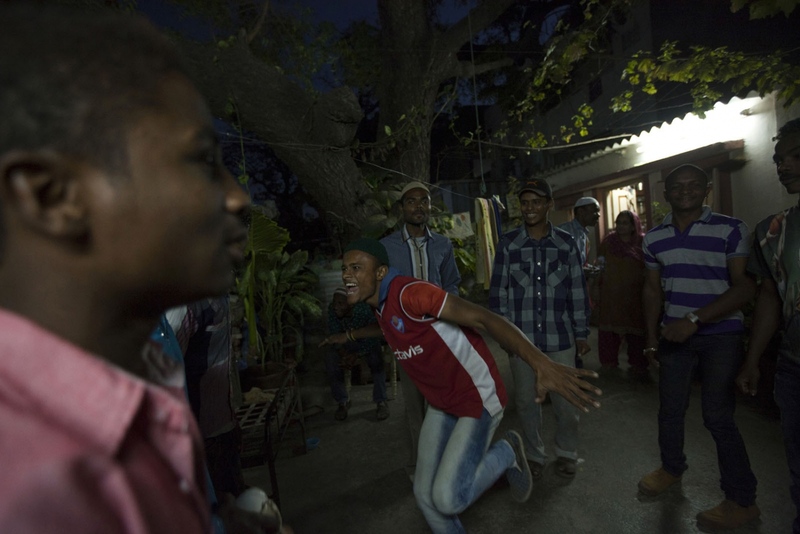 Once they arrived in Zanzibar’s notorious slave market their identity vanished and after arriving in South Asia if they weren’t to join famous army regiments of Kings they disappeared into a life of hard undocumented labour. The powerful African past recorded in history books play in stark contrast to the life of the vast majority of African slaves brought to the sub-continent and indeed to situation of the sidi/sheedi today. 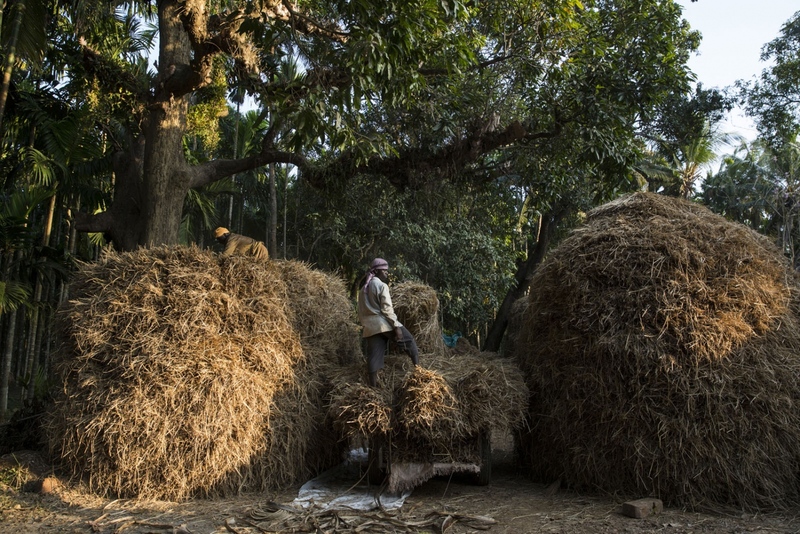 Most live on the fringes of society, often poor farmers and in remote villages, suffering from discrimination they receive little opportunity in modern day South Asia. However, this is slowly beginning to change as more gain access to higher education, they are beginning to form their own Societies and organizations, helping the development of their own communities but it is awareness of their communities, of their people, that they crave. They are proud of their African roots and those few aspects of African culture that has survived time especially in music and dance, is celebrated. But academia and modern media have largely ignored them, or rather never even known about them. 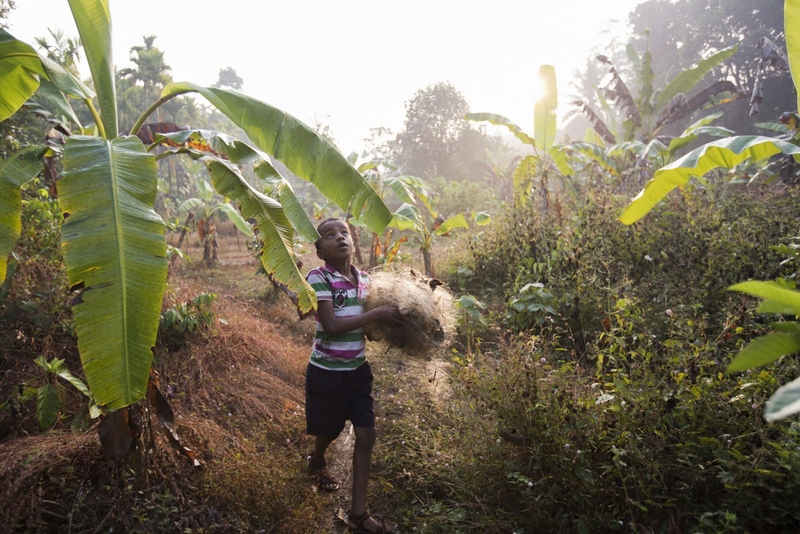 Studies do exist and books have been written and certain media outlets have even visited their villages and celebrated this unique phenomenon of the existence of ‘African-villages’ in India but that is where it ends and the media moves on. The aim of my project is to bring them a real voice by creating an in-depth photographic documentary of their culture of the various communities in India and Pakistan. And it is through these photographs that their stories and culture will be told which will ultimately instigate change. You can learn more about this project on www.thesidiproject.com. Two young Sheedi girls study in an after-school class set up in a sheedi populated community of Karachi. A Sheedi man, as Pakistan's African diaspora is known as, harvests sugarcane on a plantation. 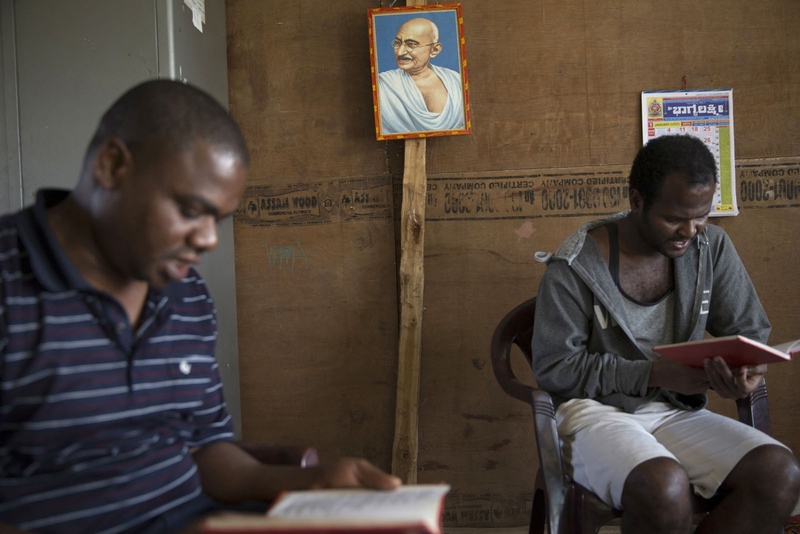 Head teacher Prakash Christian (left) and Mohan Sidi (right) take part in a bible reading session below a portrait of Mahatma Gandhi at a remote boarding school. 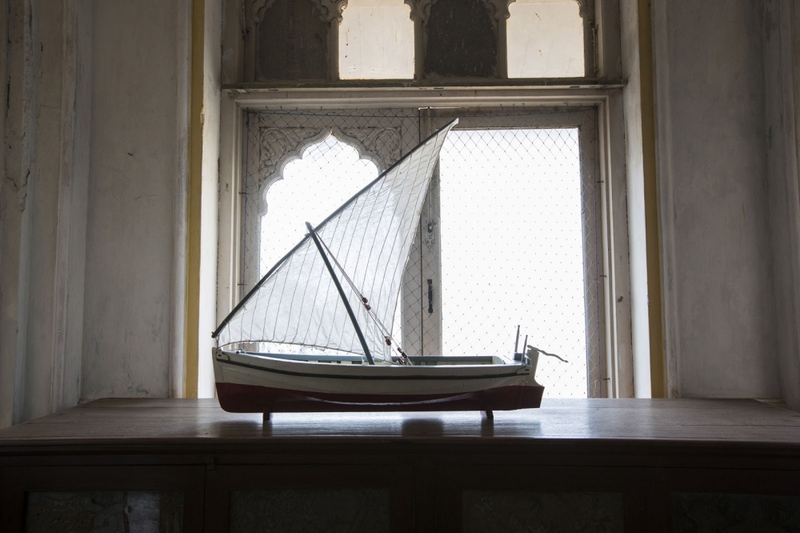 The model of a dhow boat built by a member of the sidi Royal family of Janjira and sitting proudly inside Janjira Palace, home of the Nawab of Janjira. Boats exactly like this one were used to bring slaves by the Arab traders from the slave markets of East Africa to the India subcontinent. Janjira Fort sitting just off the coast of Rajpuri village. In its heyday thousands of Sidi's plus the Nawab lived inside the fort which was never successfully attacked even by the British or Portuguese. From this ocean fortress the Sidi, master sailors, controlled virtually all sea trade in the area. 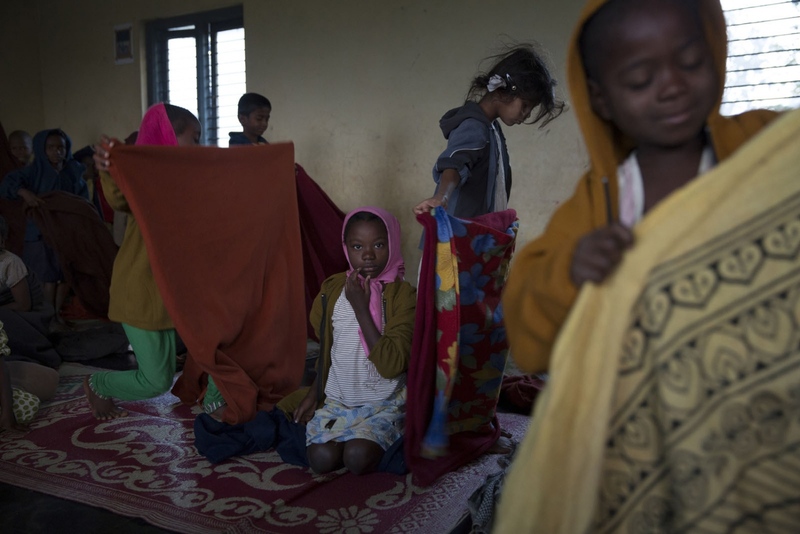 Sidi children wake up after a night sleeping on the floor of their classroom at a small rural Christian boarding school near the village of Gadgera. 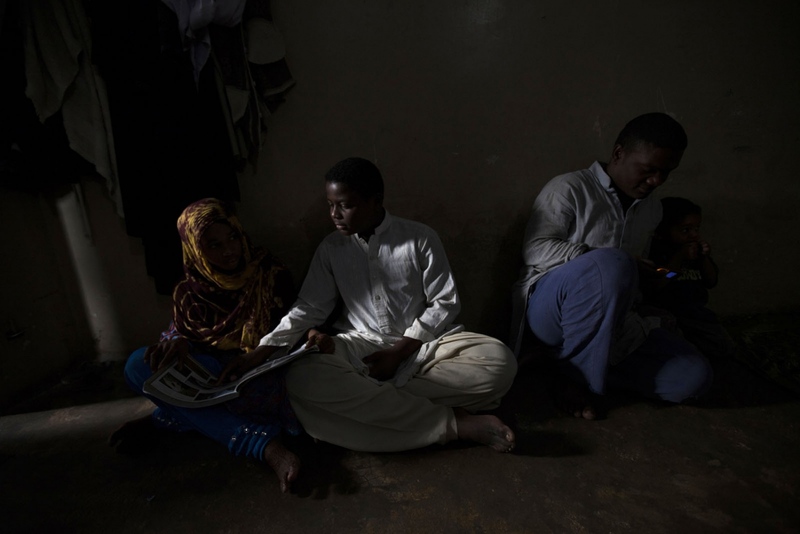 The vast majority off children attending this school are from the sidi community. A Sheedi boy, as they are known in Pakistan, helps his sister with her homework using the light from the doorway during a power cut in a suburb of Karachi. 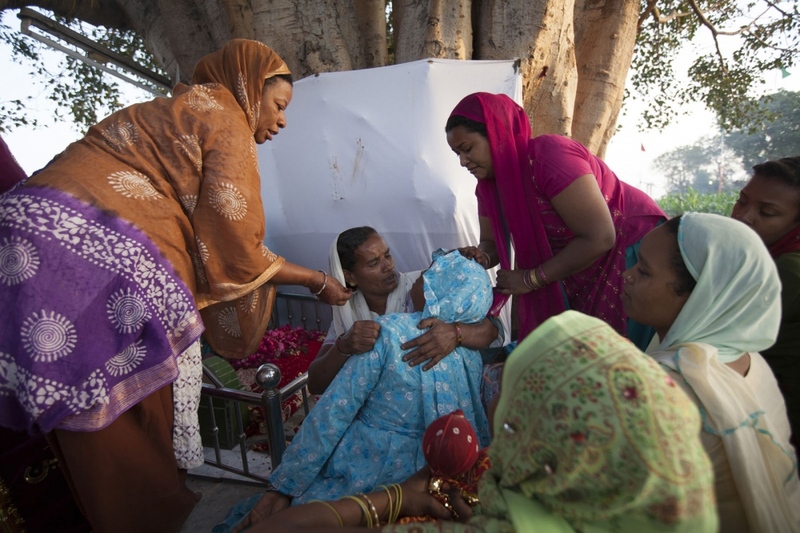 A Sidi women faints becoming possessed during the annual celebration of Urs, the anniversary of their saint Bava Gor, at the cities most holiest shrine for Sidi. They will hold this event every year and in this particular part of the shrine only women are allowed to worship. During Independence Day celebrations in the town of Yellapur a local Sidi dance troupe from Gadgera village is invited to perform. They wait back stage applying make-up before their performance as a group of Indian school children walk past. This area has many Sidi but they are still looked at with interest and intrigue as if they are foreigners. 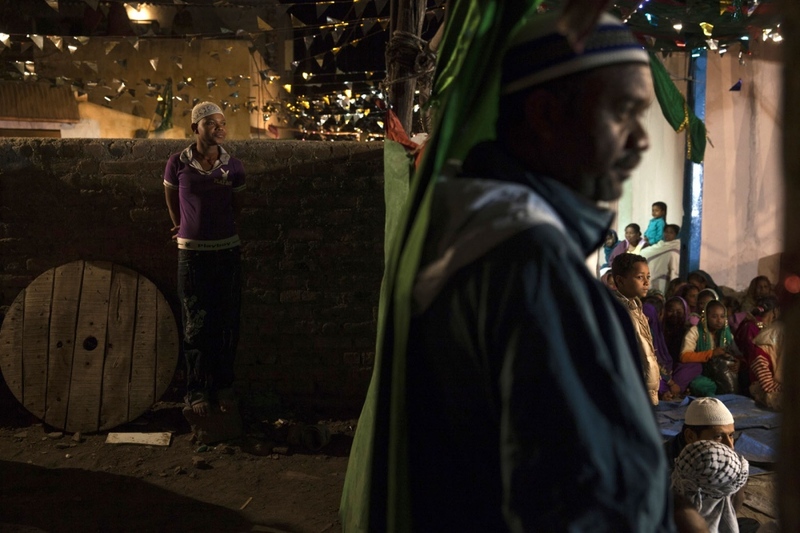 During the annual celebration of Urs, the anniversary of their saint Bava Gor, local Sidi and non-sidi Muslim's come to watch and listen to the music, singing and dancing taking place inside the courtyard of a mosque. 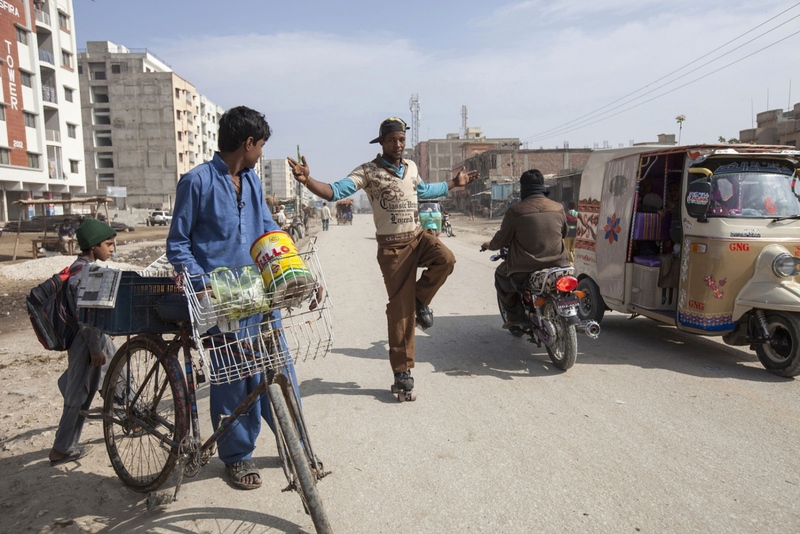 A Sheedi man shows off his skills and entertains the locals on his roller skates that he bought at a local market. Sidi women prepare the interior wall of their house with a mixture of mud, cow dung and water. During the annual celebration of Urs, the anniversary of their saint Bava Gor, the Sidi's of Jamnagar sing and play music through the old part of the city to collect money to help pay for their upcoming celebration. 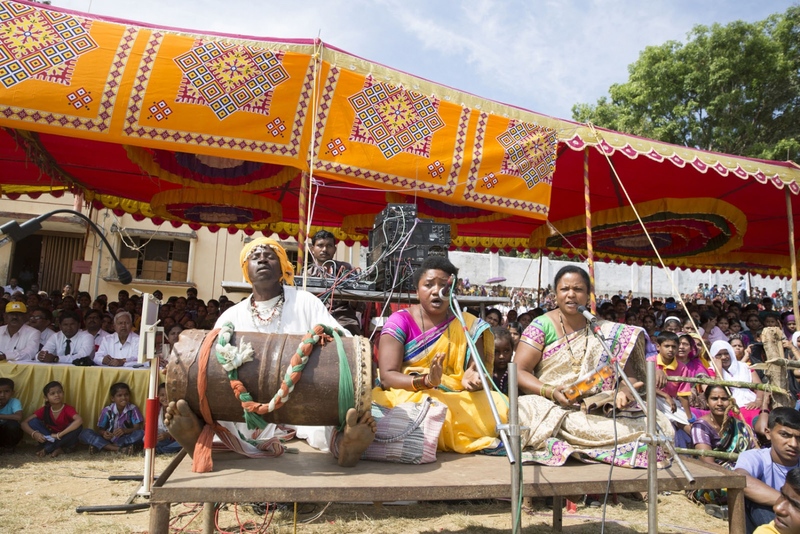 The will play music, sing and dance outside peoples houses and in return will receive a few rupees. 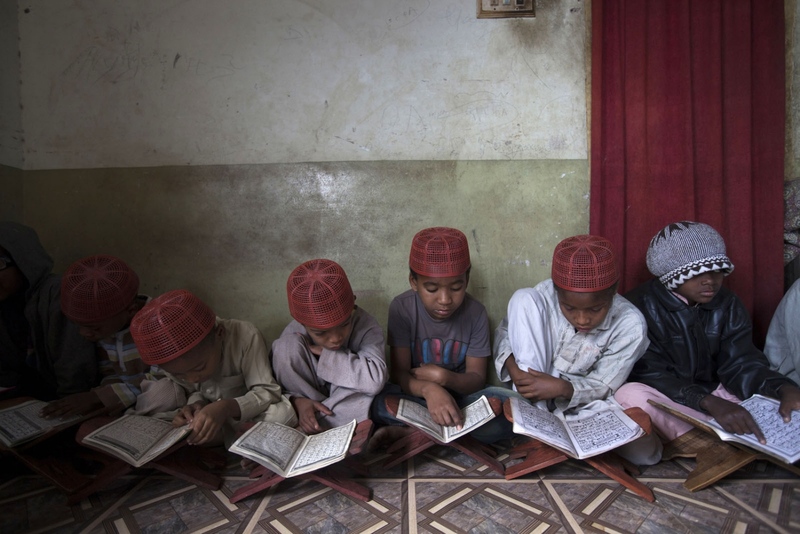 Sheedi boys learn from the Quran in a small madrassa in a rundown suburb of Hyderabad. 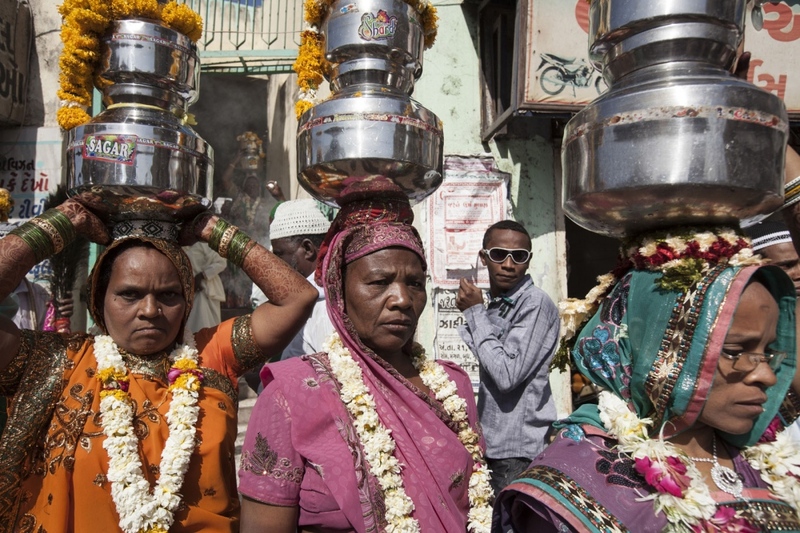 During the annual celebration of Urs, the anniversary of their saint Bava Gor, a procession of Sidi people takes them through the town of Jamnagar to collect Holy water from a sacred shrine before returning to the mosque that they left from. Annie Kambrakar stands on a pile of straw that they have recently harvested on her land outside the village of Gadgera. 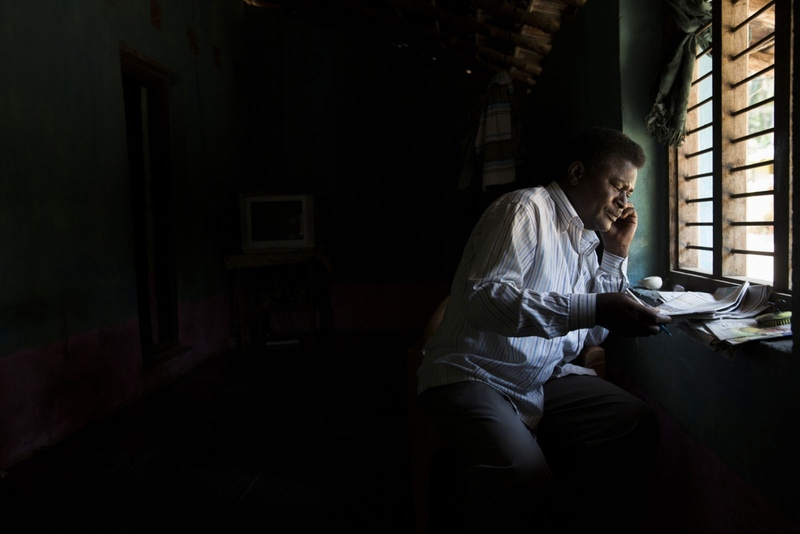 Krishna Sidi, previously the Joint Secretary of the Sidi Development Society before it was disbanded, talks on the phone inside his house. 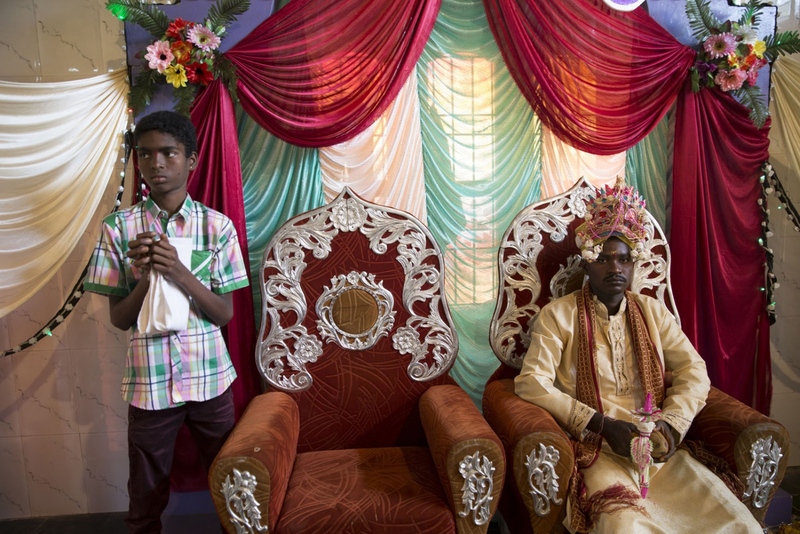 The Sidi groom sits patiently following the instructions by Brahmin priests during this Hindu wedding ceremony in Idgundi village. The first wedding of 2015 in this area receives many guests who come from Sidi villages all around. 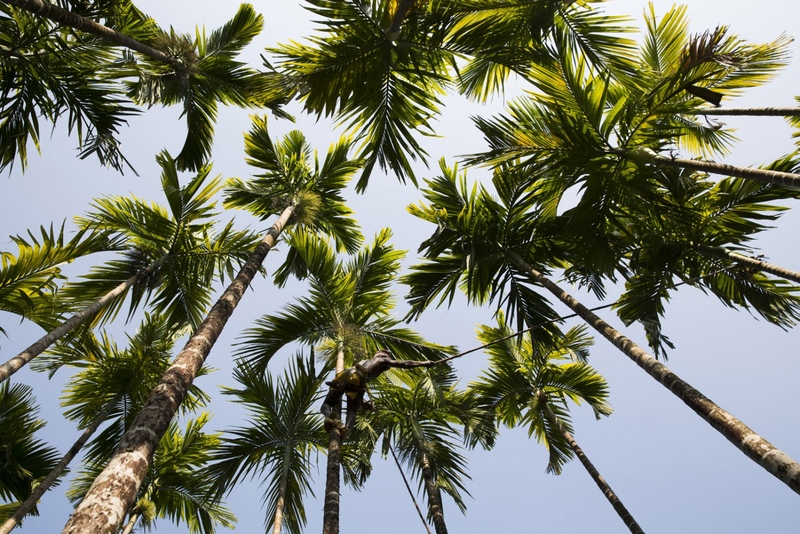 Chandresh Sidi climbs palm trees to harvest the nut that he will then sell at market. Indian's love to chew betel nut and this is one of his main crops. Sidi girls wake up after a night sleeping on the floor of their classroom at a small rural boarding school and plait each others hair before class. 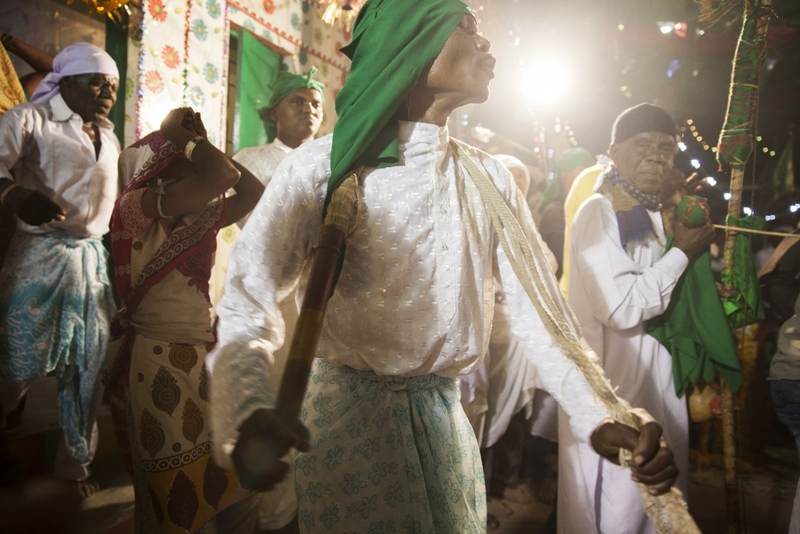 During the annual celebration of Urs, the anniversary of their saint Bava Gor, the Sidi's of Jamnagar will walk through the city to their most holy of shrine's on the outskirts of town. A mixture of local Sidi's and Muslim's watch the annual celebration of Urs, the anniversary of their saint Bava Gor at a mosque. 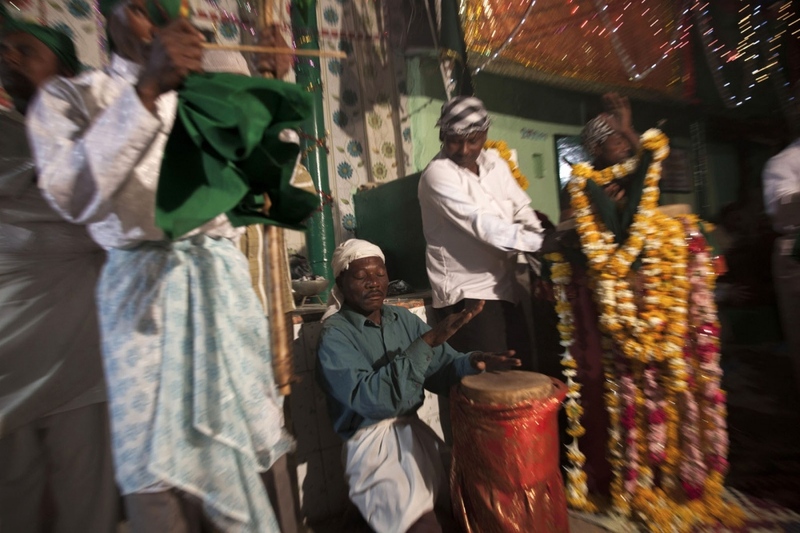 The Sidi of Bhuj celebrate by playing music, singing and dancing until midnight once a year and is a much anticipated event for the community. 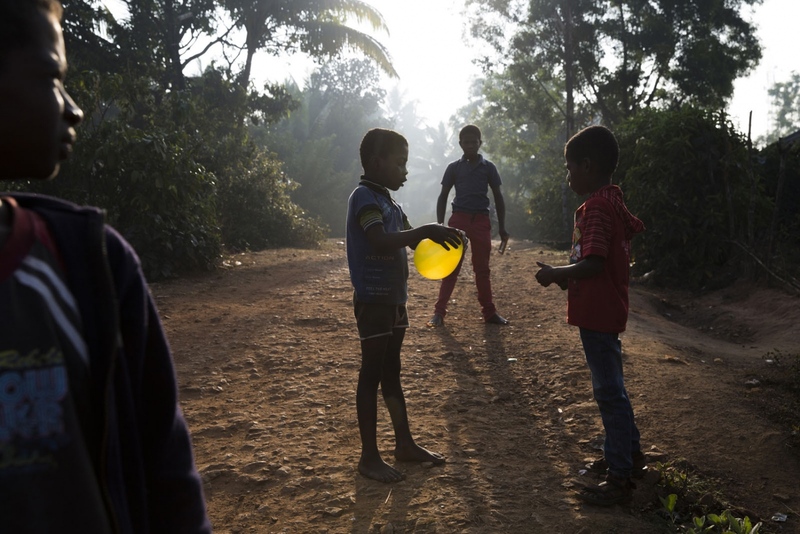 Sidi boys play with a balloon on the track outside their houses before they must walk to school. During the annual celebration of Urs, the anniversary of their saint Bava Gor, the Sidi play music, sing and dance all night until morning. 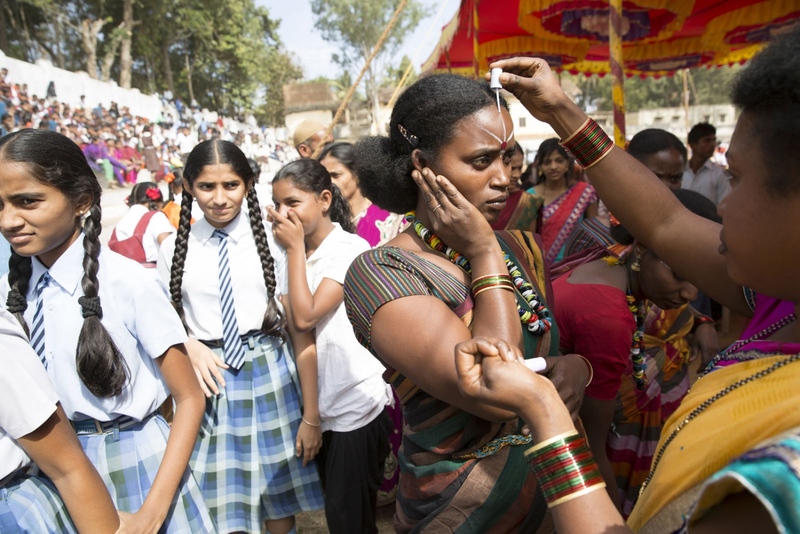 Many people become 'possessed' during this ritual and must be controlled by others. At the only school in Jambur two Sidi girls take their small blackboards to show the Indian teacher their work. The remote village of Jambur, located on the edge of the Gir forest, is almost 99% Sidi and has one of the highest concentrations of Sidi's in India. 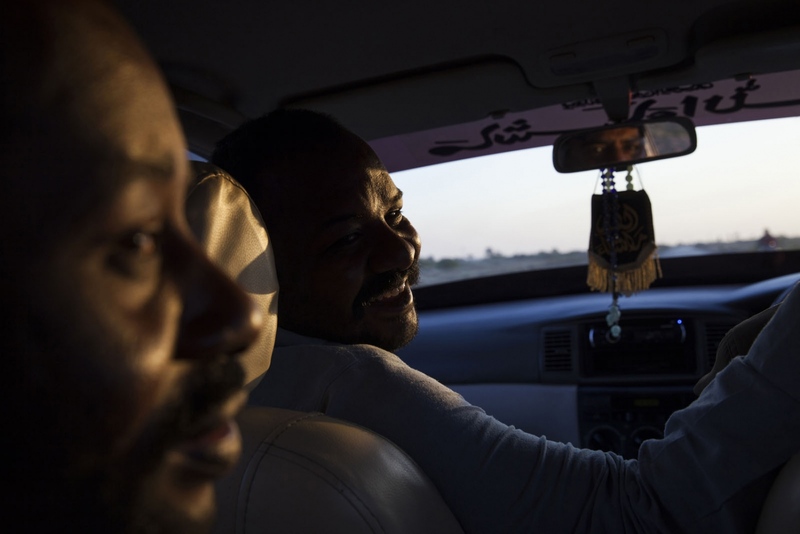 Sheedi elders drive in a car home to Hyderabad after a meeting with another Sheedi community following small dispute. The first Sidi Hindu wedding of the year in the area draws a large crowd. 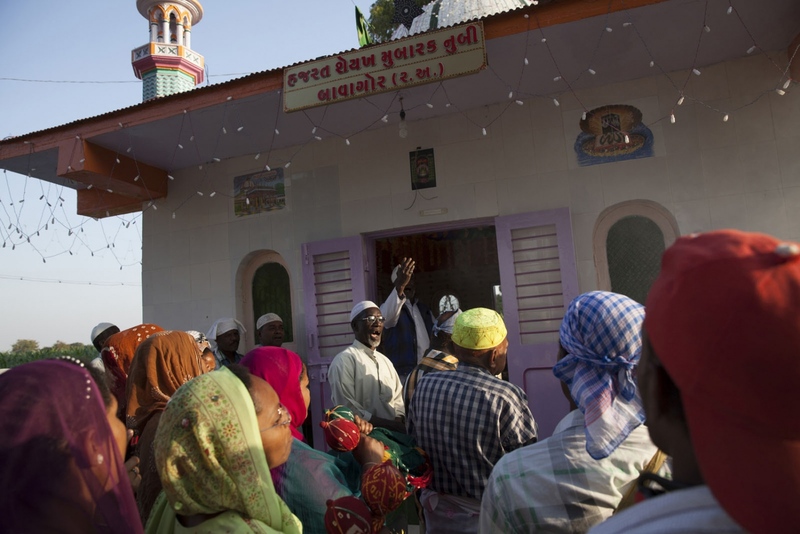 Local Sidi's travel from all the nearby villages to attend at the temple in Idgundi. 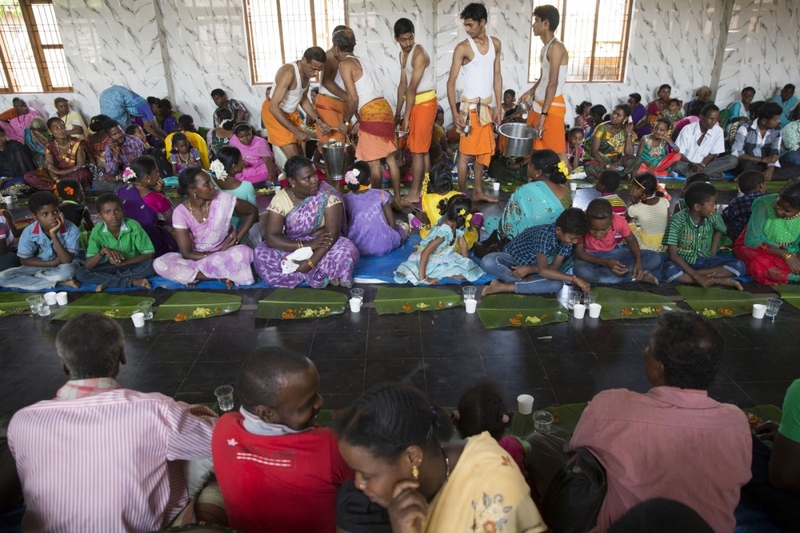 Here they wait patiently to be served food in the large wedding hall. Because so many people came the people were fed in three sittings. 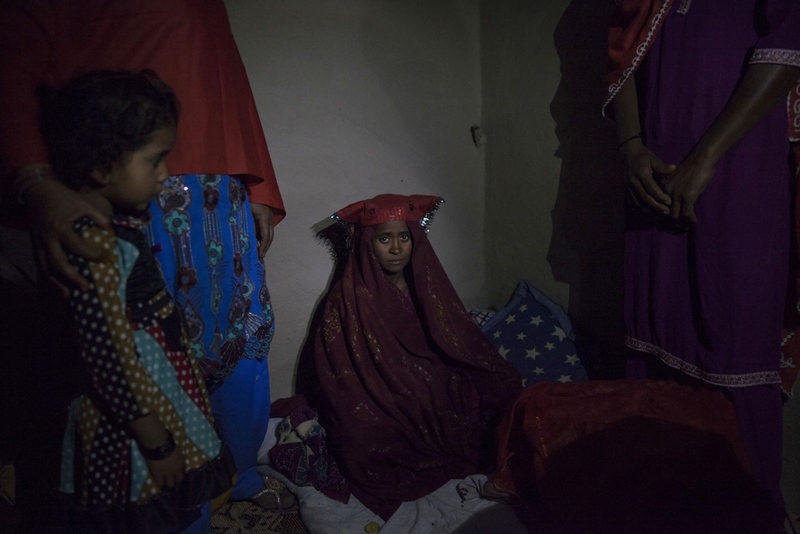 A Sheedi girl just 15 years old prepares to get married in a remote area of Sindh Province called Bedin. She will stay in this room mostly totally covered for 3 days prior to the wedding ceremony. 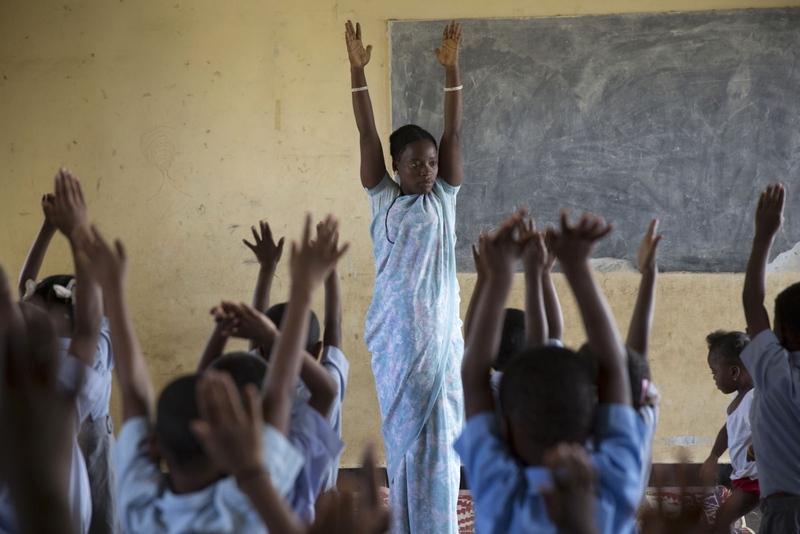 Teacher Jesintha Sidi leads morning stretching exercises at a small rural boarding school at the beginning of the school day. 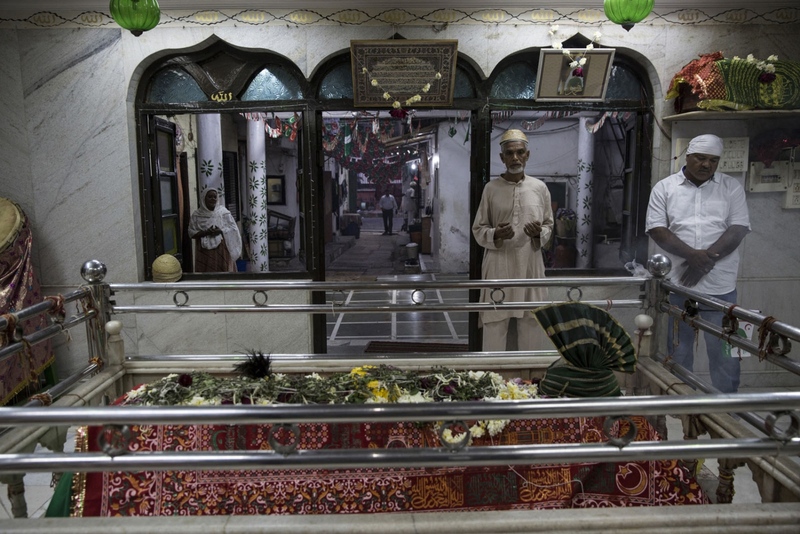 Local Sidi people come to evening prayer at the Sayed Kamaluddin Magribi Shrine in Dadar in Mumbai.The shrine is a tribute to the Sidi patron saint Bava Gor and is one of a handful of Sidi Bava Gor Shrines throughout Mumbai. Sidi men are employed as labourers loading straw in to piles after having just harvested the land for a Brahmin Hindu landowner. Sidi are not actually categorised in to any particular caste but because of their origin's are placed almost at the bottom of India's strict hierachy. During the annual celebration of Urs, the anniversary of their saint Bava Gor, the Sidi play music, sing and dance all night until morning. A Sidi boy runs home through a banana plantation after collecting the fishing net his father lay across a nearby river to catch fish overnight. A group of Sidi elders laugh and eat breakfast at a local Indian restaurant in Yellapur. 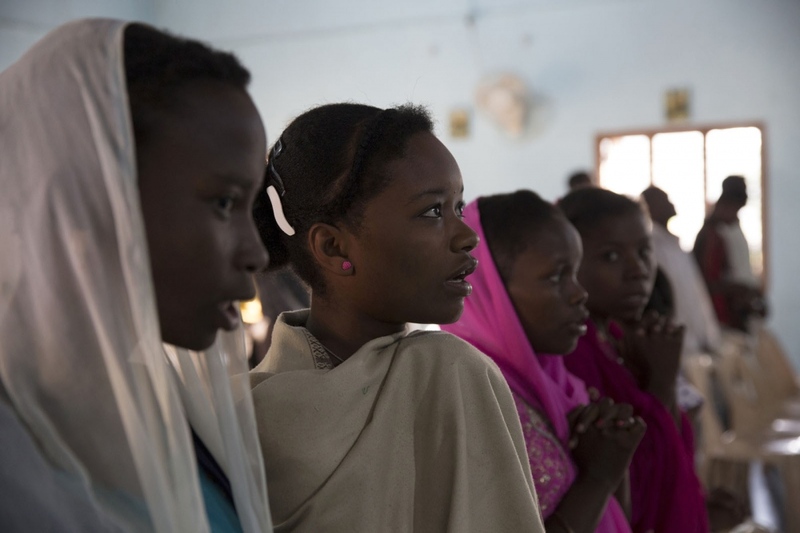 Inside a Catholic church local Sidi villagers listen to the sermon during Sunday mass. 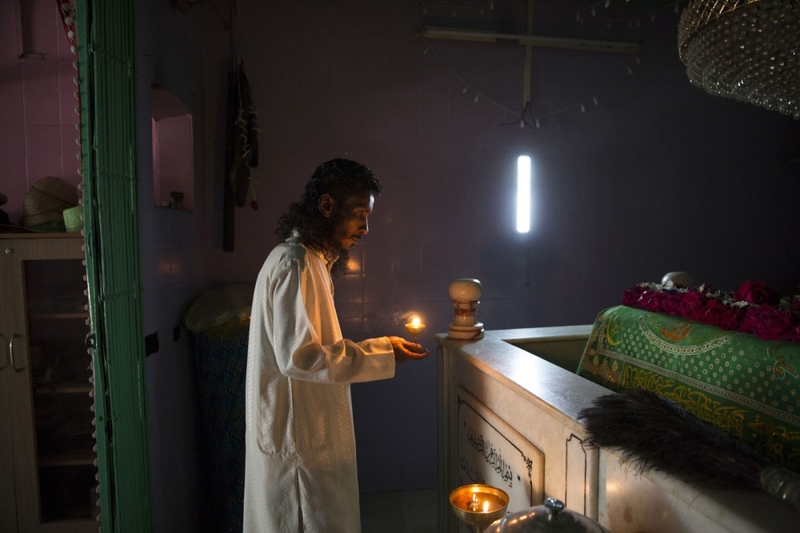 An Indian Catholic Priest drives to this remote village on his motorbike after which he will leave to perform another service in another village. During Independence Day celebrations in the town of Yellapur a local Sidi music and dance troupe from Gadgera village are invited to perform. They wait back stage before their performance. Imam Siddi Abdul Rauf l of the Siddi Mubarak Bava Gor Mosque lights a candle at the shrine of Bava Gor, the Sidi patron saint. 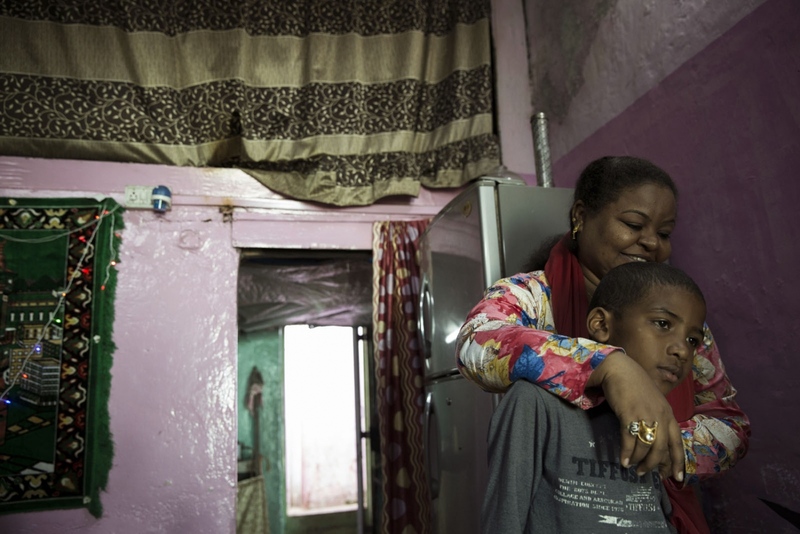 Heena Sidi hugs her son in their home in the large slum area of Narayan Nagar area of Mumbai. 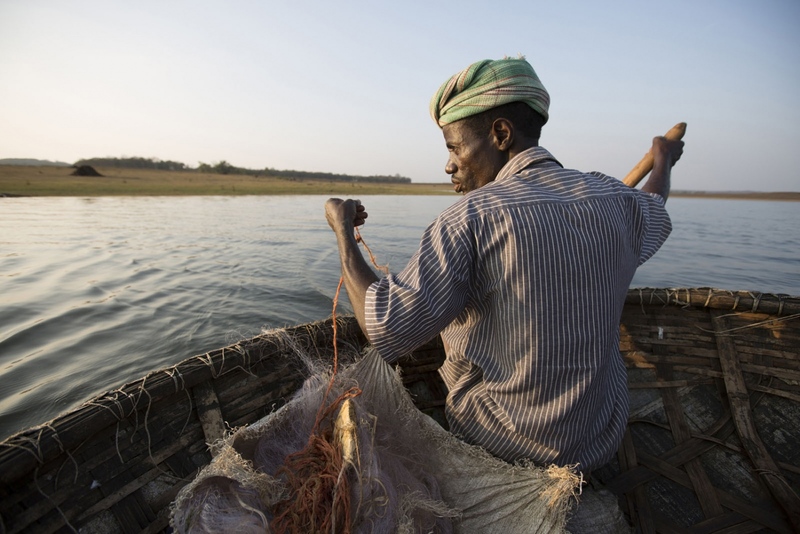 A Sidi man fishes in a reservoir in a traditional conical boat. 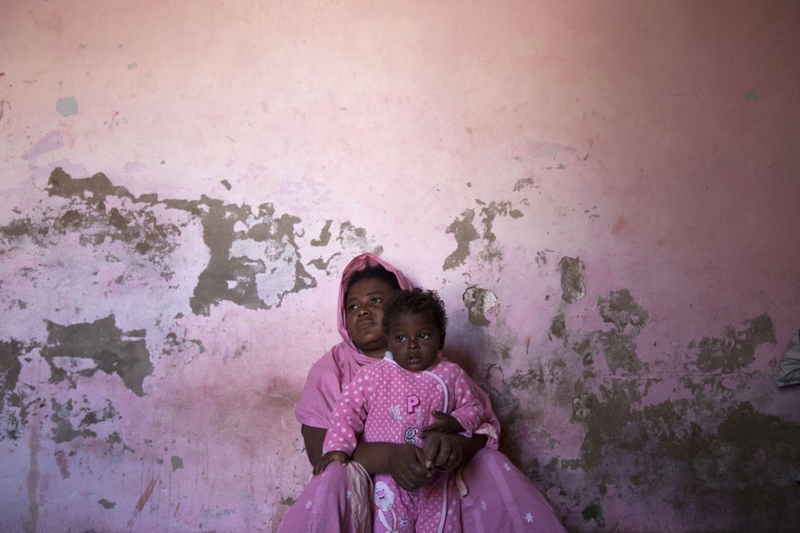 A Sheedi women sits with her child at her house in a Sheedi suburb of Hyderabad.